For Sale: This is a PX4 Storm subcompact in 40 Cal. It is a nice shooting, accurate pistol. I have put about 300-400 rounds through it since purchased in Nov. 2015. 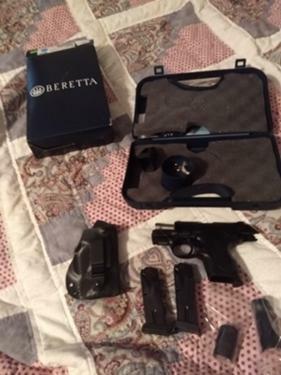 Like all Beretta's, it is smooth, tight and well made. I am asking $450 OBO. It comes with 2 mags, speed loader, additional back straps, a nice kydex tuckable holster and i will include a couple boxes of ammo as well. Txt or call Tim at 814-233-1932 >Buyer must pay transfer fee.